Developer Mommy’s Best Games has announced that it will be putting the 2D arcade puzzle-maze game Pig Eat Ball on Switch. It’ll be available sometime in Q3 2019. 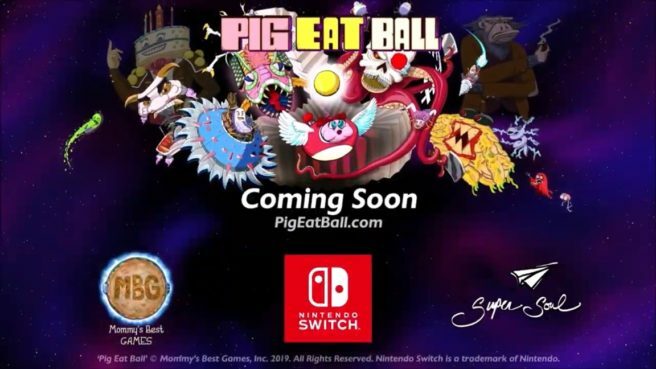 Pig Eat Ball involves eating and barfing to get through the game’s various levels. 214 handmade levels are included, along with more than 10 humongous bosses, over 20 interconnected worlds, and 38 power-ups. – Twisted arcade gameplay – get bigger as you eat and barf to squeeze down to size. – Explore intricate worlds – travel to five completely unique areas. – Hand-crafted challenge – non-procedural levels. – Massive bosses – use your brain, your skills, and your mouth to beat nearly a dozen of them. – One-of-a kind powerups – dozens of disguises with special abilities. – Open-ended antics – barf on them, bump them, torch them, or knock them into open space. – Hours of adventure – the main story is 8-12 hours alone but you’ll have to complete the challenge section too. – Wild characters – speak with tens of aliens in your journey. – Manic multiplayer mayhem – play with up to four fellows in multiplayer local mode. – Online leaderboards – each action level lets you compete for the fastest time with the world. – Online level sharing – craft your own stages and share them with your friends or the world.